25 Trailers pitched up today on a slightly chilly morning but the Main Group soon warmed up on the slog up Kloof Corner. 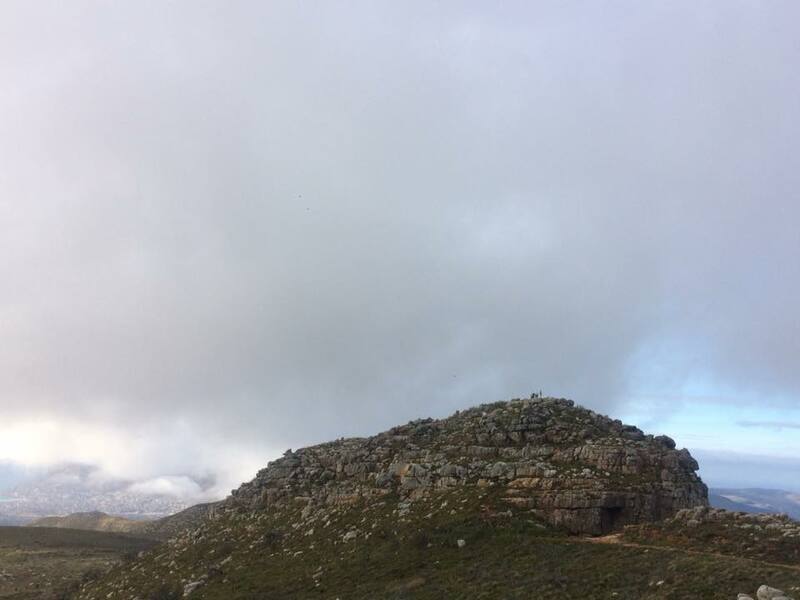 We headed out to Oppelskop and instead of just running past it we went to the lookout for those who had never bagged that ‘peak’. The Main Group of 17 split naturally into 3 speed groups on the way back with Natalie leading the way, Allison in the middle and Liz sweeping. 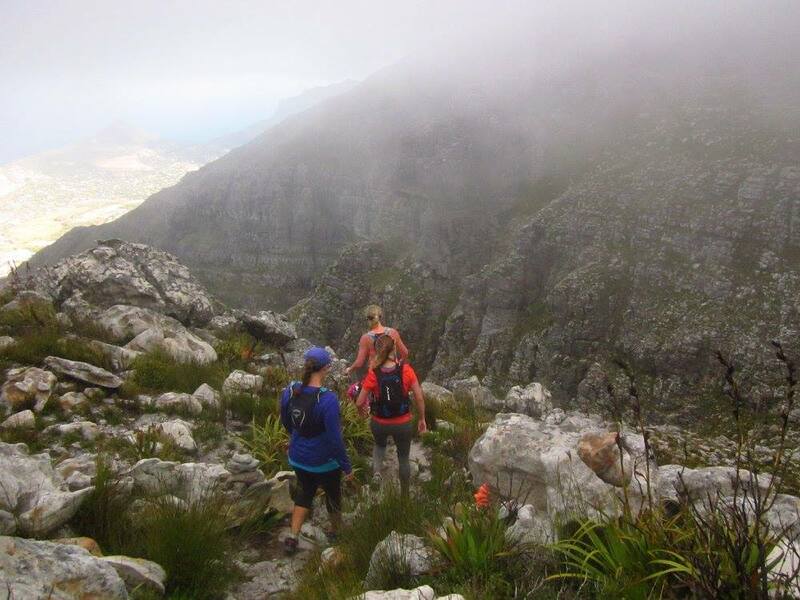 The Main Group did between 12.5km and 13.5km depending on whether they chose to go down at the Cable Car path or carry on to Kloof Corner stairs. They took around 3hrs. The Relaxed Group of 8 led by Julian did a Signal Hill/Lions circuit 9.65km in 1h31. A lovely uneventful run with no mishaps. The plan was to try a new take on an old favourite​ by starting at the reservoir car park instead of the main gate, with the ultimate intention of ending the morning with a swim to wash off the dust and sweat. However, the weather didn't play fair and we were almost blown off our feet on arrival at the gate at 6:45am. Liz braved the gusts to document the sky while the rest of us huddled in our cars. Once everybody had signed in, we broke into two groups, Main and Relaxed, knowing that the Main Group would break up once we reached the first hill. After a brief explanation of the route, we set off towards the first photo op at the old fire lookout overlooking Noordhoek. This was a first for the Trailers and much excitement was expressed and the obligatory photos taken. 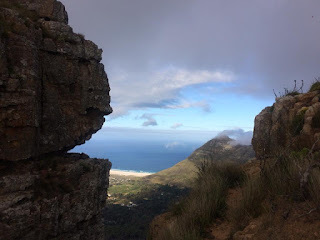 As the Main group (still together at this point) descended the knoppie, the Relaxeds climbed up and there was much checking that sufficient pictures had been taken of the view of Noordhoek beach through the gap in the peaks. 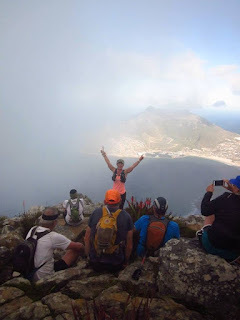 The next section of the run was to Noordhoek Peak where we climbed up into the thick mist and the cloud eclipsed the view of Hout Bay, frustrating our photographers. Judy managed to conduct the thick cover into remission for long enough to take a few snaps. The group was keen to move on quickly however, as the temperature at the top was quite icy. Neil marvelled at the pool of fresh water in the basin of rock. 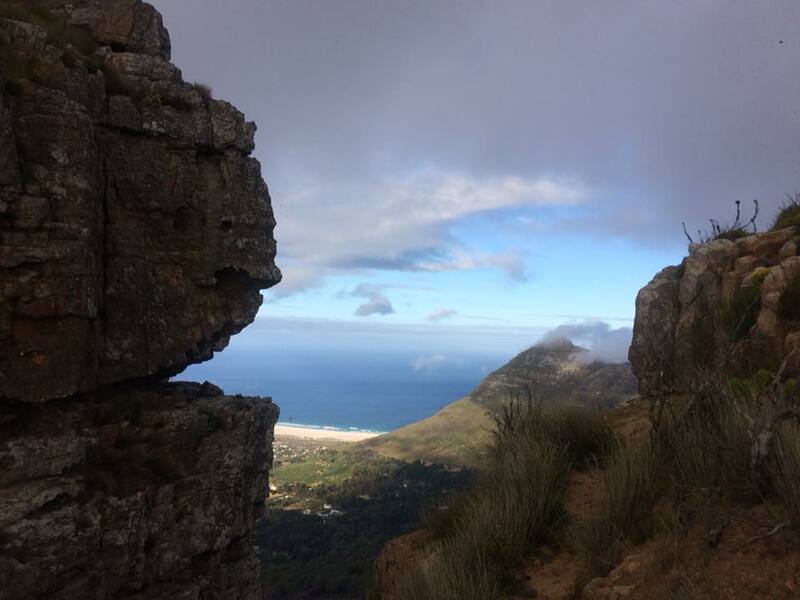 At the next fork in the path, the group was given the option to take the 'Danger: High Winds' route around the sea-side of Noordhoek Peak or the safer jeep track, and the split resulted in only Lorraine and Neil taking the low road. The daring-do group split into two however, the front runners led by Greg and swept by Geoff and the second group led by Theo and swept by Liz. Progress was fairly slow for the back runners, according to reports, but Neil and Lorraine reached the Blackburn Lookout long before either of the other two groups. The last part of the first half of the planned figure-of-eight was a simple jeep track run as far as the reservoir path. It was at the reservoir that Neil and Lorraine met up with the Relaxed group who were about to set off on the lower half of the 8. Relaxed watches read roughly 6.5kms and so the planned 2kms to the main gate and 2kms up the River Walk was deemed to be a fine. We deviated from the map slightly in taking the boardwalk around the dam before setting off up the jeep track again, this time looking for a path to the left. As we started running, we saw the both Greg's and Theo's parts of the Main group arrive at the reservoir, expecting them to catch up with us within a short time. HOWEVER... 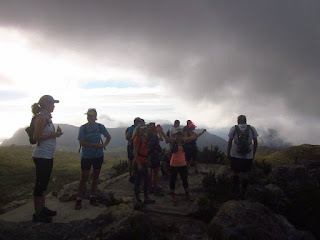 It seems that Noordhoek Peak had taken the wind out of their sails, or maybe it was the psychology of running past the parked cars, or maybe it was pressing appointments, or whatever the reason, but the Main groups decided not to do the second half of the run as planned! (Faders!) Instead, they found a short loop which brought their total distance up to some 10kms and went home - except for Sam and Judy who were determined to have a swim and a picnic, and Felicity & Theo who had to wait for Neil, their chauffeur. 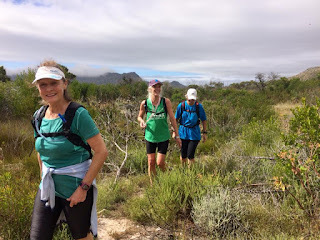 The newly named Fast Relaxeds (Neil and Lorraine) and the Regular Relaxeds enjoyed a fabulous sandy downhill single track (recognised by Lorraine as the Old Fisherman's path) all the way down to Ou Kaapse Weg. Thank goodness for Marge's phone-map, as we turned off a little early and needed to make a detour after a couple of hundred metres. Everybody agreed that the fast runnable trail was a really lovely new discovery for the Trailers. The final leg of the morning was a tiring slog up the River Walk, which had never felt longer. It's interesting how different a section of trail that's usually covered at the beginning of the morning can feel at the end of a run! 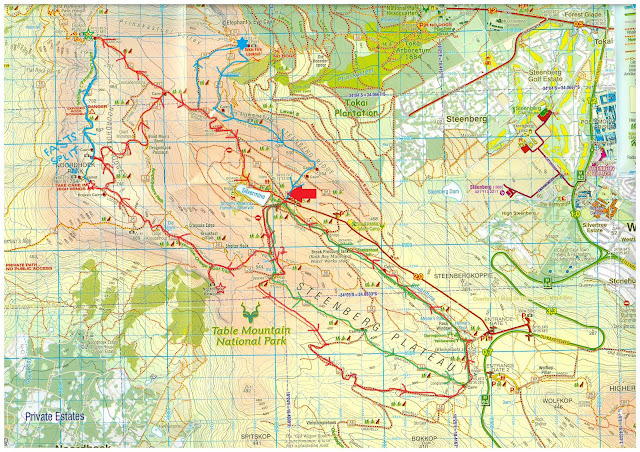 The final distance for the Fast Relaxeds was 15.3kms, which took a total of 2h39 running time, but 3 hours overall. More photos on facebook. Thank you, Liz. Despite the southeaster howling around us and the tablecloth covering the mountain, Kloofnek parking was a calm oasis! It was actually quite hot! Jayson led the fast group of three, hoping to find the correct route around Signal Hill, the medium group was led by the usual committee and the relaxed group were very organised with their route plotted and saved on Marge's phone. We all started together up the hill and turned left up the Lion's Head route to take a small deviation from the usual path just for fun! 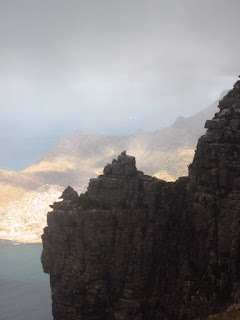 After climbing up and around we looked over signal hill and the city and took the path leading down to the Kramat. Here we came into contact with some of the wind, but it was welcome due to the heat! The path round Signal Hill and back along to the base of Lion's Head was long and hot. Very different when it is at the start of the run! But it was good to have some runnable track. On the way back we took The Glen path to avoid the road and to get some shade for the last slog uphill. A good 12.5km run for fast and medium groups; slightly less for the relaxed group. Hot with lots of uphill but a great run with stunning views all around. Lovely weather greeted a group of excited trailers on Saturday morning for our first official run of 2018. 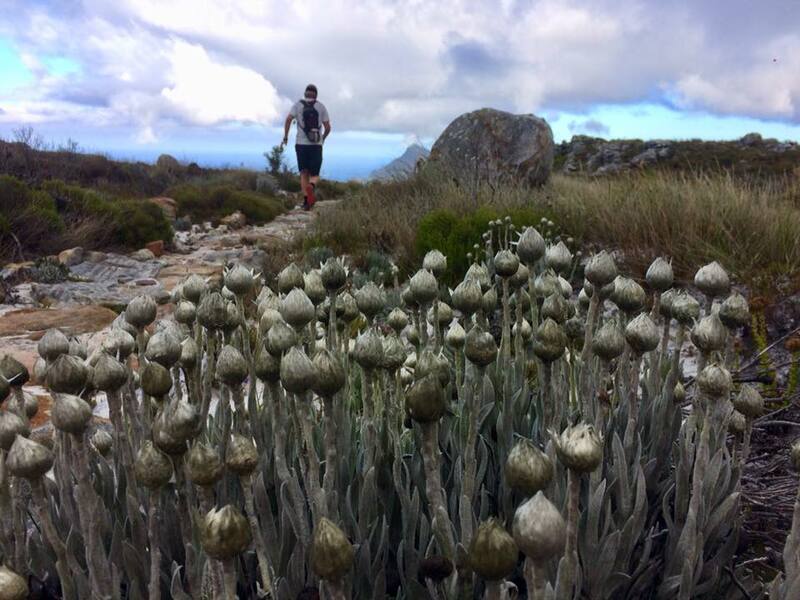 Those who joined the Dripping Disa hunt the week before were looking forward to smaller hills and much less climbing than the preceding week. The weather was hot but the forest was cool and shady making for pleasant conditions on a lovely summer’s day. As trailers were gathering around a large rock, our run organiser stepped up on his soap box for the customary gear check and route briefing. The trailers split Geoff Nell leading a faster 2man&1woman group, the main group led by the usual committee and the relaxed group led by Marge van Vuuren. 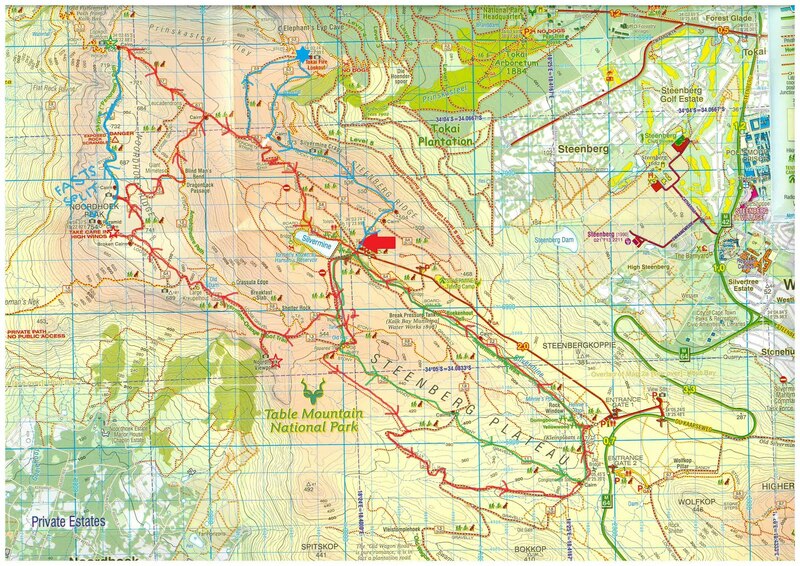 The groups followed a similar circuit around Newland Forest and surrounds. When the briefing was over the faster group sped ahead and wasn’t seen again until the main group came across Geoff near Kings Block House. After pushing up to the Block House he decided to send the (now) 1man&1woman team on ahead and joined the main group for a more relaxed paced run. 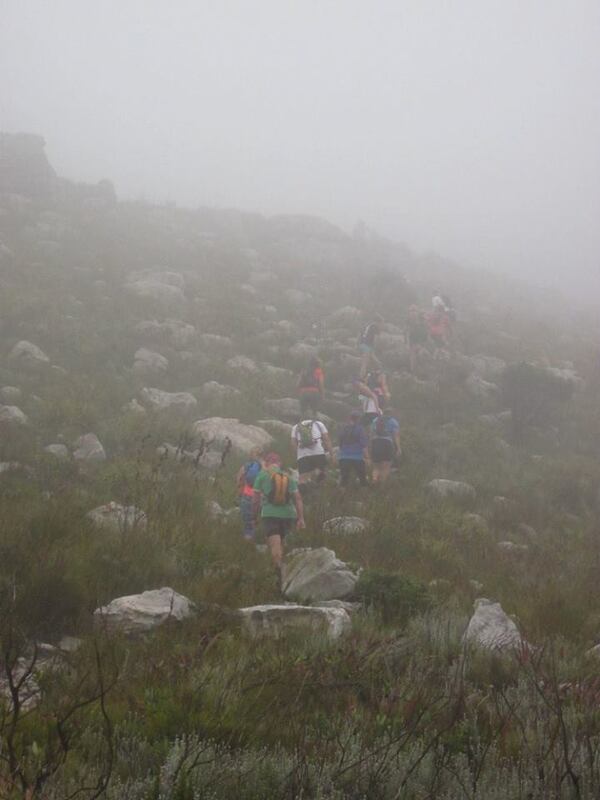 Meanwhile the mediums ran comfortably along the lower jeep track and paths past the Newlands Reservoir joining the tar to Rhodes Memorial just below the SANParks offices. Here they had some friendly banter with some local mountain bikers also making their way up the hill. 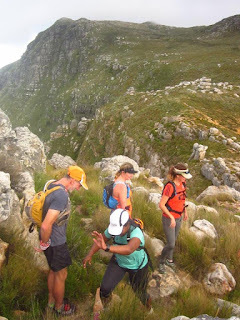 After the customary group photo over the city, the main group headed along the much loved contour path towards the base of Skeleton Gorge taking in some lovely wooded ravines, little streams and vistas of city. Whilst en route the main group encountered the relaxed group, who had taken a more direct line to King’s Block House. 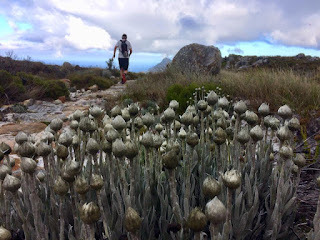 After a quick chat the mains were off again, heading to the boulders at the foot of the “Aloes”. This was our second big climb of the day and ensured some good cardio and high spirits. Once on the other side of the Aloes the mains trotted along to the base off Skeleton Gorge. Here run organiser Theo was out voted 30 to 1 for a return over the Aloes and back to the boulders. The mains headed into Kirstenbocsh and managed to smoothly find their way to the “Paradise Ruins” due to the collective experience of the committee. At the ruins there was the usual flash history lesson after which the group continued back to the Newlands Fire Base. The relaxed group’s adventure took them to the boulders at the foot of the Aloes from where they explored the forest down towards the Paradise ruins. Then, due to concerns about time, the group decided to head directly for the fire base. Once at the fire base there was the usual post run chatter and then it was off to the rest of a sweltering Saturday. A great morning out with the amazing folks of Table Mountain Trailers. A special thanks to Liz for the photos. Please see the TMT Facebook page.